I’m going to bear this film in mind, the next time I think of cats as ‘impossible to train’. At the moment, I can’t even handle one six month old French Bulldog puppy. Pickle is driving me insane, mainly because she’s smart. A smart Frenchie can be a dangerous thing, because she won’t let me get away with suff like spending four hours watching videos on Funny or Die, when she feels we should be doing something more rewarding like going for a walk or doing some table training. She expresses her disapproval by knocking over the water dish, and stomping through it with her fat little feet. She then sits in the water and glares at me. I knew keeping one of Delilah’s daughters was a bad idea. That makes four generations of smart, impatient Bullmarket girls all in one household. I’m doomed. Maybe I should just get more cats. As some of you know, Tessa had a turn for the worse over the weekend. As of now, however, she’s still here, hanging in. We’ve set up a small space for her with carpeting covered with wee wee pads, with a nice cozy bed and her water dish. It’s right in front of the fireplace, too. She seems to be doing fine, now that she’s not trying to negotiate the hard wood while also fending off Pickle, who thinks Tessa’s face is a secret goldmine of uneaten food particles. She’s eating again, and last night she picked a fight with Sailor (that’s a really good sign, around our place). So long as she is comfortable, and not in any pain, I’m going to keep the smelly old girl around for a while longer 🙂 I know full well that she is, indeed, slowing down, but there’s still some fight in her yet (just ask Sailor). Tessa spent the first 48 hours of her life living in a bathtub. Her mom, Tara, decided to go into early labor the day before we were due to move house. Timing wasn’t perfect, and I was frankly in a state of panic. This was only my second French Bulldog litter, and no one had prepared me for ‘what to do if you have newborn puppies and a house full of movers’. I had to find a quiet room, one that wouldn’t have movers constantly going in and out of it, and that seemed to be the bathroom, on both ends of the move. I lined the tub with heating pads and thick blankets, turned on the space heaters, and stuck “Do NOT Open This Door For ANY REASON!! !” signs up. Count Down to Tessa’s Big Day! 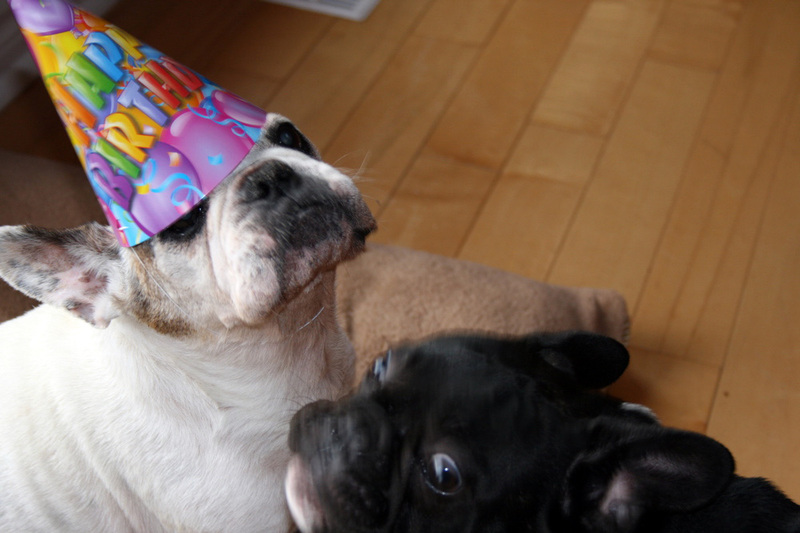 It’s less than 24 hours until the big day – Tessa (Bullmarket Terror of Toronto) turns fifteen years old. We’re holding a little party for her tomorrow, with her in house relatives, but I’m hoping for some photos of her kids, grandkids, greatgreatgrandkids, whatever! If Tessa is in your dog’s immediate pedigree, I’d love it if you sent me a photo. Include their registered name, their pedigree (if you have it), and their call name, along with your name. I’ll be putting up a great big post with all the photos as soon as they’ve all come in. Tessa gave birth to three litters, but those three litters produced 23 puppies, 21 of which survived! So, she’s got quite a family tree, and we’d love to see your ‘branch’ of it. 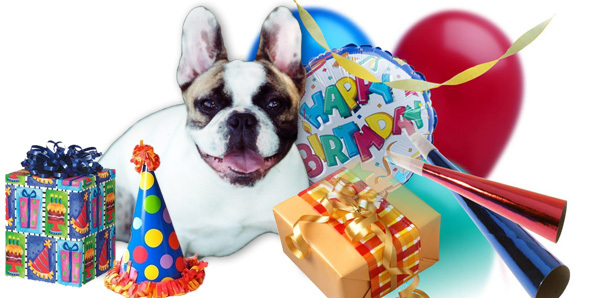 https://i0.wp.com/www.bullmarketfrogs.com/wp-content/uploads/2015/04/Brindle_pied_frenchbulldog.jpg?fit=662%2C662 662 662 Carol http://www.bullmarketfrogs.com/wp-content/uploads/2015/06/bullmarket-logo.png Carol2009-11-21 14:41:482009-11-21 14:41:48Count Down to Tessa's Big Day! As hard as it is for me to believe, Tessa will be fifteen years old next month. Those years have flown by, in so many ways. 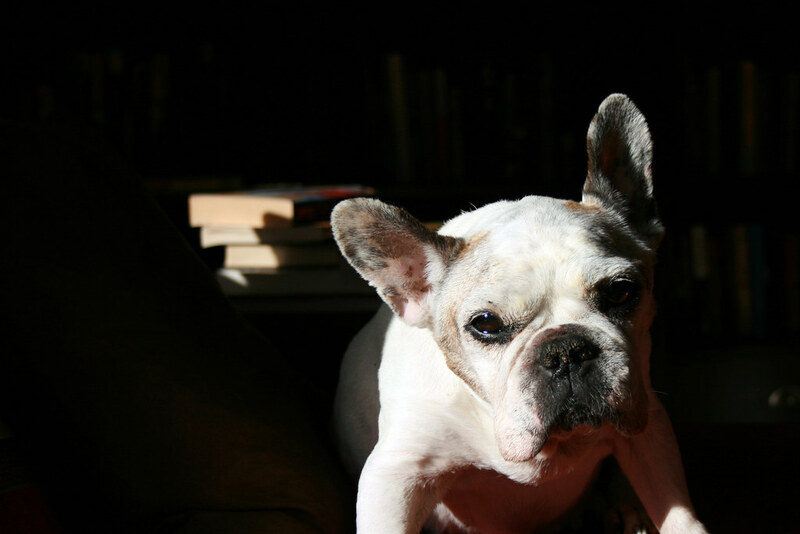 Tessa, for me, is still the relcalcitrant, surly little hooligan I tried to haul to work with me at six weeks, with her bucking and flailing at the end of the lead, as I slipped and slid on an icy Yorkville sidewalk, cursing her stubborn little bulldog brain. She’s also still the doting mother who never once willingly weaned a litter (she still allowed Sailor to nurse on her, for comfort if not food, when Sailor was almost six months old). She’s the smart, sassy little dog who taught me that French Bulldogs are NOT like other dogs when it comes to training, and that what might work with a Mastiff will barely make a dent on a Frenchie’s conciousness. Tessa is doing remarkably fine for a dog of her advanced years. Other than a few episodes of ‘idiopathic neuropathy’, breath that could melt paint, faded vision, limited hearing, a wobbly rear, and a reappearing growth on the side of her neck, she’s still mobile and happy to be here with us. She enjoys warm fireplaces, polar fleece dog beds, short drives in the car, and shorter walks up the wooded path behind our house. She also still engages in the occasional battle for dominance with her daughter, granddaughters, great grandkids and great great grandkids. A few days ago, she launched herself at Penelope, apparently because Penelope was ‘looking at her funny’. Nell responding by rolling Tessa off the couch, and Tessa sulked her way over to her crate, where she sat grumbling about the lack of respect in today’s kids. 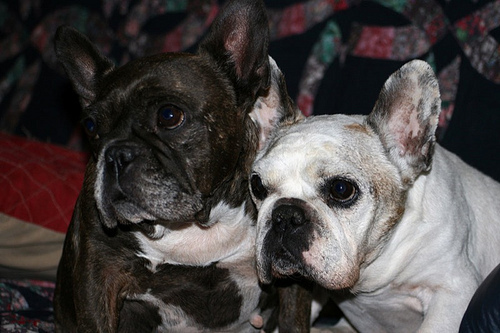 Tessa is a daily reminder to me that no matter how much I love our puppies, there will always be a special place in my heart for our senior dogs, and an irreplaceable spot for my Grand French Bulldog Matriarch. I’ve been mulling over my growing hatred for anyone who says that they can “understand the reasons behind breed bans”. This, coupled with my increasing suspicion that most of this hysteria can be blamed on the media, has left me a rather grumpy person lately. 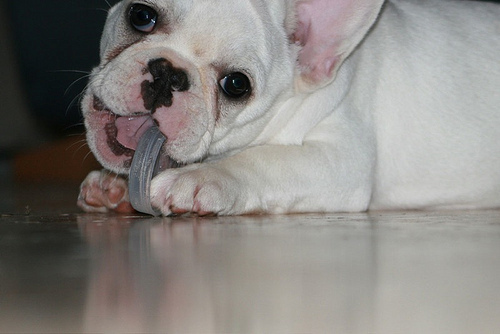 In case of grumpiness, spend ten minutes watching puppy play with bottle cap. I was going to post a big, long, unhappy rant about stupid people and the stupid things that they say, but instead, let’s look at some photos of happy Frenchies. It’s better for my blood pressure, and it’s probably more fun for you, the reader.